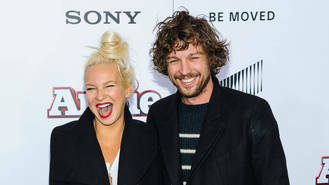 Pop star Sia and her husband Erik Anders Lang have split. The Australian singer/songwriter and her now-estranged partner announced the shock news in a statement on Wednesday (07Dec16), insisting they are "dedicated to remaining friends". The brief statement reads: "After much soul searching and consideration we have made the decision to separate as a couple." The Chandelier hitmaker, real name Sia Furler, wed filmmaker Lang at her Palm Springs, California home in August, 2014, just two months after the couple became engaged. It was Sia's first marriage. During their time together Sia and Lang started work on a documentary together through his production company Pictures, Pictures. The Untitled Sia Documentary Project was created to give fans a chance to see never-before-seen aspects of the singer's life. Sia was down to direct the film. The star also helped fund her husband's documentary about the game of golf after a crowdfunding campaign helped him raise $50,000 (£39,500) towards filming costs. She offered fans personal performances and new music in exchange for donations to fund the project, Be the Ball - a film about golf meditation techniques. Last year (15), a love letter Lang wrote to his wife was read by actor Shia LaBeouf as he introduced Sia at the Grammy Awards in Los Angeles. The movie star, who appeared alongside dancer Maddie Ziegler in Sia's Elastic Heart video, took the stage at the Staples Center before Kristen Wiig and Ziegler's dance interpretation of the song and began his heartfelt tribute by stating, "I love you so... I raised a white flag for you, defeated finally. If strength were made of broken pieces, you and I would always win. It is, though, and building and statues wink at us. I could squeeze you to zero. I'll never know another. What am I going to do? Punch me if I stop crying, and I'll do the same." He ended his odd speech with, "Love, Erik". A source told Us Weekly, "Erik and Shia conspired together and did this as a gift to Sia. She was completely surprised and had no idea." News of the marriage split comes a day after Sia scored three 2017 Grammy nominations, one for her Zootopia song Try Everything, and two for her latest album, This Is Acting. McFly feel "completely refreshed" for the first time. Justin Bieber will headline Barclaycard presents British Summer Time Hyde Park 2017. Justin Bieber's Sorry video was the most popular promo on Vevo this year (16), racking up 1.8 billion views worldwide. Jennifer Lopez's on/off boyfriend Casper Smart has ruined his car after smashing it into a tree. John Legend and Chrissy Teigen want to have "three or four" kids together. Bob Dylan has announced a UK stadium tour for 2017. Ronnie Wood would love The Rolling Stones to do a club and pub tour. Rag 'n' Bone Man has been crowned the winner of the 2017 BRITs Critics' Choice Award. Michael Buble's cancer-stricken son Noah will reportedly undergo surgery at the end of December (16).